Pancreatic malignancies are usually carcinomas and most literature relates to these tumours. A very small number of pancreatic neoplasms are endocrine tumours that resemble the endocrine portion of the pancreas. These are classified into well differentiated endocrine tumours, well differentiated endocrine carcinomas, and poorly differentiated endocrine carcinomas. 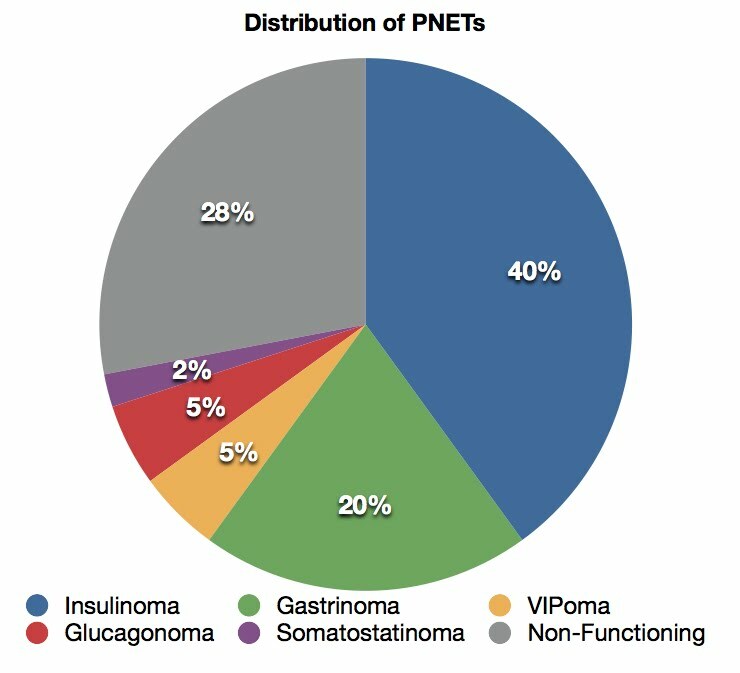 The most common endocrine tumour of the pancreas. It normally occurs within the pancreas itself. Patients present with hyperinsulinaemia and hypoglycaemia, usually with increasing frequency over time. The hypoglycaemia is usually not constant as patients have sporadic release of insulin from the tumour. These tumours are usually < 2 cm in size. Gastrinomas are the second most common endocrine tumour of the pancreas (20%). They are usually located in the head of the pancreas and are usually > 2 cm in size. Gastrinoma is associated with Zollinger-Ellison syndrome, where hypersecretion of gastrin leads to excessive stomach acidity and abdominal pain, often with diarrhoea. Vasoactive intestinal polypeptide increases secretions into the gastrointestinal tract. Excessive production leads to profuse watery diarrhoea. Prolonged diarrhoea leads to electrolyte disturbances. These tumours make up 5% of pancreatic endocrine tumours. The syndrome is also known as "Verner-Morrison Syndrome". VIPomas usually occur in the tail of the pancreas. Glucagon raises the blood glucose level and promotes gluconeogenesis. Glucagonomas make up 5% of pancreatic neuroendocrine tumours. The classical presenting sign is migratory necrolytic erythema, often with weight loss. Functioning somatostatinomas produce the least apparent of the functioning neuroendocrine tumour syndromes. Patients often complain of abdominal pain and diarrhoea. The tumour is usually an incidental finding during investigation of the patient's symptoms. They usually occur in the pancreatic head. Patients present with local effects of tumour rather than hormonal effects (eg. abdominal pain, obstructive effects). A chromogranin A blood test is usually positive and confirms diagnosis. These tumours are frequently metastatic due to late presentation. Pancreatic neuroendocrine tumours of any of the above types can be benign or malignant, and this is perhaps more important as it influences their curability. Microscopically, these tumours are characterised by bland cytological features, minimal anaplasia, and regular growth patterns. Necrosis is not seen and mitoses are infrequent. Well differentiated endocrine carcinomas are either functional or non-functional; the most common subtype is gastrinoma. They are characterised histologically by the presence of some pleomorphism/anaplasia and possibly necrosis. A high mitotic rate is present (but less than 20 mitoses per 10 high power fields). Metastases and local recurrence are common in this group. The classic example is small cell carcinoma of the pancreas. These tumours are almost always non-funtional and appear similarly to small cell carcinoma of the lung. Mitotic rate is over 20 per 10 high power fields. They are often quite large at presentation and rapidly progressive.